Something that is to be expected, yet still surprising when traversing the Croatian islands of Dalmatia, is the change in language. The dialects of Croatian will actually shift in very large degrees from island to island and people who are native speakers can tell which island someone is from depending on how they talk. So, while all one language, it can definitely make for some tricky conversations. If someone doesn’t speak English, but does speak other languages besides Croatian, it will likely be easier to have them speak in a mix rather than the normal Hvar dialect, which is very difficult to understand even if you know a fair degree of Croatia. Those who live on the mainland coast have a word for the people on the islands (specifically, Hvar), which is, ‘bodulski’. It is difficult to get out of folks if this is meant as an insult, but you’ll find things like the Bodul Hotel on Hvar, so even if it has negative connotations, people seem to take it in stride. When it comes to wine though, there is one item that really sticks out with the difference of language, which is that they call, Plavac Mali, Plovac Mali. 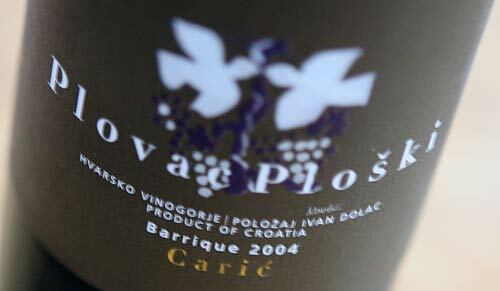 You can most distinctly see on the bottles by the one of the most delicious wineries, Vino Hvar, from the Carić family. Note that the spelling doesn’t change the fact that this is still the same wonderful varietal that is grown elsewhere in Dalmatia.